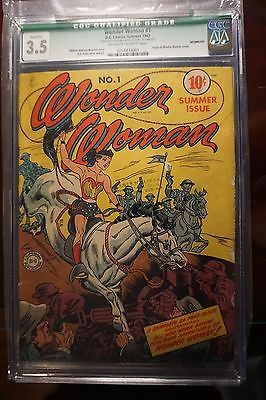 WONDER WOMAN #1 (Summer 1942, DC) - CGC Q 3.5 - UNRESTORED - WOW! WOW - AFFORDABLE KEY GOLDEN AGE BOOK. Not many #1's go up for sale, and UNRESTORED. Qualified 3.5, missing centerfold. This was my copy and it was slabbed about a year ago, and case is immaculate! The pages are supple, and color is OFF WHITE TO WHITE!! I thought it would grade out at 4.0, but oh well. However, I did NOT have it pressed. Good Luck on a super rare opportunity for an AFFORDABLE copy of a nice looking wonder woman 1!!! No Returns as this is a certified book, guaranteed to be encapsulated. Will be shipped insured with signature required.